Before a few years ago, the only way to attend summer camp as an adult was to become a counselor. However, if you’ve always dreamed of attending summer camp and never got the chance to, or miss the days of drinking bug juice by the fire, you’re in luck. Adult summer camps have been gaining popularity around the U.S. for grownups looking to recreate their childhood, or have binged too many episodes of Wet Hot American Summer. Whatever your reasons, here are the top summer camps that open to adults. Happy camping! Arguably the most socially inclined of the adult camps, Club Getaway is about fun, freedom and friends. The 300-acre camp is located in Kent, Connecticut, about 90 miles from New York City, and has all the classic camp activities (swimming, crafting, hiking) along with more unique adventures like hot air ballooning and trapeze. After dark, the vibe is decidedly more adult with a free flowing bar and themed dance parties each night. Club Getaway also features a variety of themed weekends including a camp for families, members of the LGBT community, Gen Xers, and Jewish young professionals. Designed for the opposite of party animals, Soul Camp is the hippie cousin of summer camps. 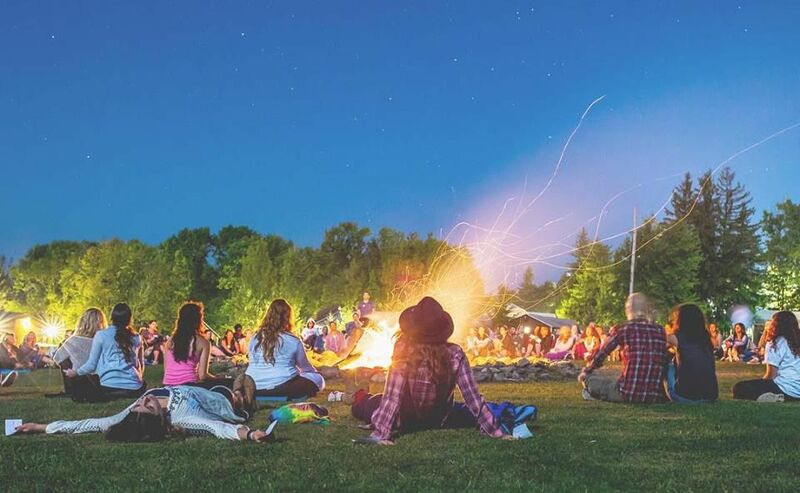 With a strong focus on yoga, meditation, and healing, the camp is an alcohol-free experience and focuses on the detoxification of the mind and body. The camps are held all over the U.S., and if you’re not into sleepovers, or short on time, Soul Camp also offers a day camp option at their Chicago and New York locations. For the campers that prefer to exercise their minds over their bodies, Space Camp is for you. Located in Huntsville, Alabama, campers learn about NASA and commercial space exploration initiatives and get to test their newfound skills in a simulated mission and model rocket launch. If you are a child of the Nickelodeon era, this camp is your 1990’s dream come true. Their motto? “You’re never too old for space camp”. Camp No Counselors is another classic camp-style retreat situated in Paradox, NY that promises an “escape to happiness” for campers. There are 200 coed campers in each location (there are several around the U.S.) that enjoy a weekend of water sports, arts ‘n crafts, epic nightly theme parties, gourmet meals, and an open bar. At this camp, there is no wifi and cell phones banned, in order to encourage campers to meet new friends, and reconnect with themselves and nature. Located in Spokane, Washington, this year marks Camp Sweyolaken’s 26th annual women's only camp. The retreat features a wide range of activities such as canoeing and yoga, as well as more luxe offerings like massages. Unlike the other camps that require campers to be 21 years old, this retreat is open to adults 18 and over. For the campers that prefer to sleep on Egyptian cotton sheets over a sleeping bag under the stars, The Ritz-Carlton in Bachelor Gulch Colorado bridges the gap between outdoor vs. indoor enthusiast. This is the inaugural season for their version of an adult summer camp, and that means activities like whiskey and woodburning and painting and pinot are offered, along with adult-friendly treasure hunt expeditions, educational hikes, and intimate dinners. This is the camp you wish your parents sent you to.